Funky Old Time | Westbrook Brewing Co.
Funky Old Time was aged for 18 months in two American oak red wine barrels with wild yeast/brewing bacteria. Aged for 18 months in American oak red wine barrels with wild yeast/brewing bacteria. A: Pours a dark mahogany with reddish hues. There is effectively no head, just some off white fizzling bubbles. Leaves no lacing. S: Vinous, sour dark fruits, oak. Actually reminds me a lot of RR Consecration at first. Then some of the base beer aromas come out with licorice, caramel, subtle cocoa and booze. Exceedingly complex, with layers of aromas. Wonderful. T: There is a big sourness, mixed with a heavy red wine boozy component that makes it rather astringent at first. The upfront flavor is a bit harsh for me, but once it settles it has a wonderful lingering aftertaste of dark fruits, cocoa, oak, and subtle coconut. M/D: Full bodied, carbonation on the lower end of the spectrum (but not to the degree that the Brandy OT was), ABV noticeable but no heat. Very dry. Drinkability is average. O: This is an interesting one for me to give an overall rating to. I love some components (the aroma is absolutely fantastic and the lingering aftertaste flavors are sublime), but the sour/venous combo upfront is not my favorite. I honestly think this would have been better without the wild yeast. Just my opinion though. Overall, still very enjoyable, unique and quite complex. Definitely worth a try, but my least favorite of the 3 Old Time's Ive had so far. Only Grumpy left. 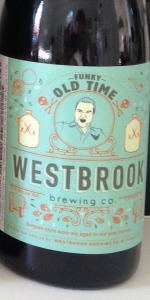 Funky Old Time from Westbrook Brewing Co.